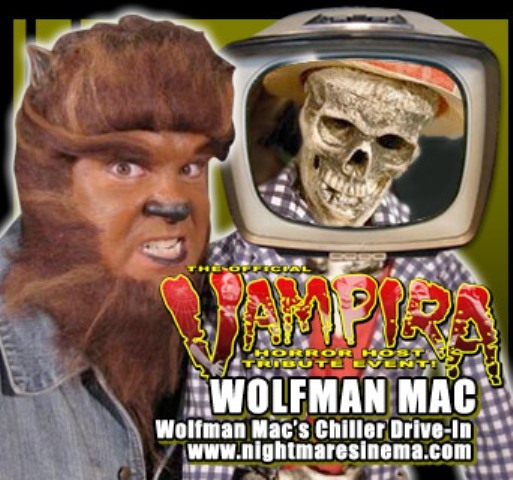 Wolfman Mac’s Chiller Drive-in Hits Horrorhound! 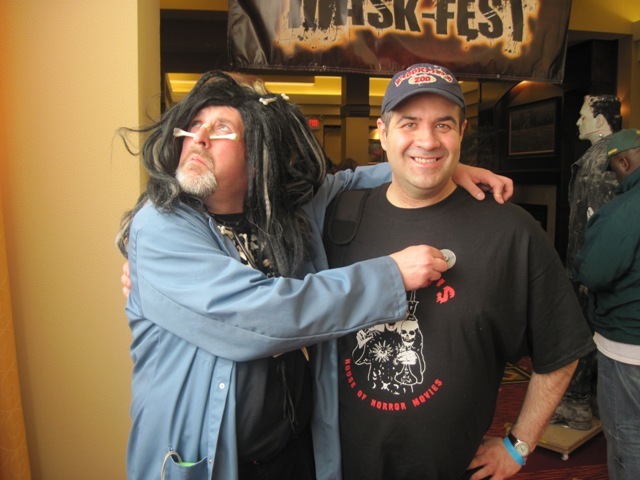 Wolfman Mac has the honor of being the first local horror host I’d ever watched after Svengoolie. Last January I was thumbing through YouTube clips when I stumbled upon “Wolfman Mac’s Chiller Drive-in.” Although Mac is a fellow Midwesterner (Michigan), it was the other Dave in Rhode Island who had access to his show via a cable channel called RTV (Retro Television). I asked him to send me some copies and he was happy to oblige. Mac has the distinction of being the favored host among my two daughters, Leia and Jade. In fact, they absolutely adore the guy. Every time a package arrives at the house they immediately ask, “Did you get more Wolfman Macs?” Last Saturday they watched THE BAT with Vincent Price from beginning to end. It’s probably a good bet that Jade is the only one in her 3rd grade class to have sat through an entire Vincent Price film, willingly. It’s an even surer bet that I’m one of few dad’s who gets filled with pride by saying this. Regardless, it has been great sitting back and watching vintage monster movies with the kids without having to bribe them. Yes, I was definitely looking forward to meeting Wolfman Mac and was worried that, with all the activities going on at Horrorhound, I’d end up missing him. Prior to the convention, I did have some positive interaction with both Mac and his show’s producer, Vicki Vanderkolk. These were in the form of Facebook comments and a fan letter I sent him. When I arrived at The Chiller Drive-In booth, Mac was surrounded by a full television crew while busily interviewing people from a gathering crowd. While Mac was busy on camera, I formally met Vicki and found her to be as genuine and pleasant in person as she was on Facebook. She introduced me to her husband, Raymond Dean Vanderkolk, who writes for the show. I was very happy to shake the hand of the person responsible for the show’s memorable skits. The next day I bumped into Mr. Vanderkolk again. This time he was clad in his own costume – that of a witchdoctor! Raymond Dean Vanderkolk: Laughter is the best medicine! While talking to Vicki she said, “You’ve got to let Mac interview you for the show!” I waited my turn before finally meeting the man himself. He was a lot of fun and the same off screen as on. Definitely a “salt of the Earth” type…despite his affinity towards a full moon. I recounted the story of how a guy from Chicago became a fan of a host up in Michigan and then we howled together on camera which was lots of fun. Mac signed a Chiller Drive-n Promo poster for both myself and the other Dave. After the convention I had it professionally framed and it is now prominently displayed over my desk at home. 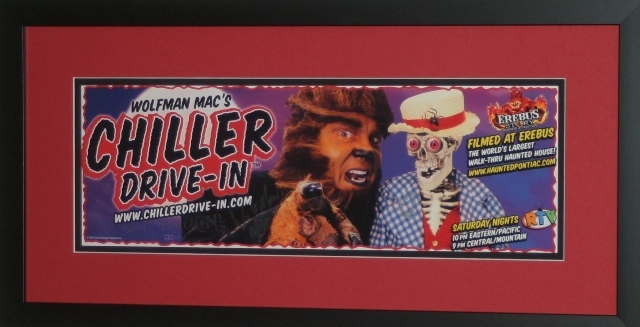 After the convention I submitted a fan piece about “Wolfman Mac’s Chiller Drive-in” to “Scary Monster Magazine.” I really hope that it will see print. If my children are so taken by the show, it’s a good bet other kids out there will be as well. 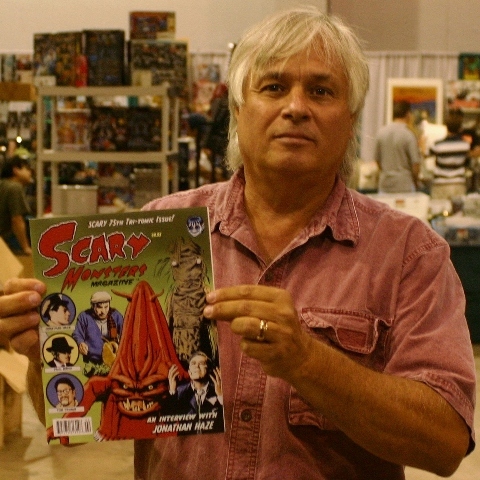 During G-Fest, I hand delivered some episodes of the show to Dennis Druktenis (publisher of “Scary Monsters Magazine”). He later wrote and thanked me for them. Not that I’m above bribery, but I really did want him to see the show for himself. After I had all my pictures from Horrorhound developed, my kids weren’t in the least bit impressed with my photos of Elvira, Romero, nor Savini. When the shot of Wolfman Mac and I popped up, however, they jumped up and down screaming, “I can’t believe you met Wolfman Mac!!! !” while telling me how unfair it was that I should be so lucky. 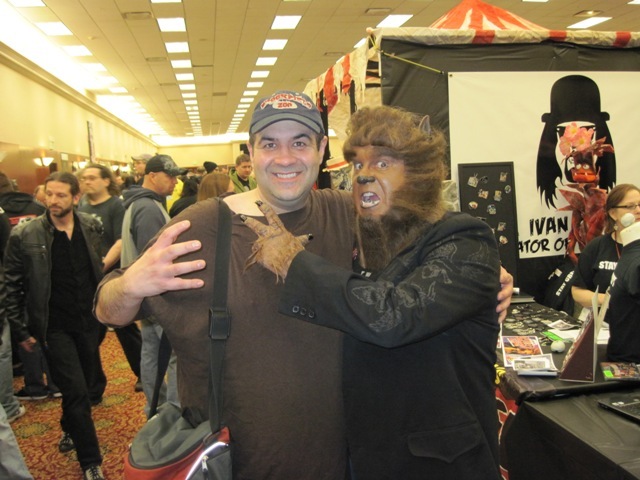 They were right; meeting Wolfman Mac was one of my favorite memories from Horrorhound. NOTE: Wolfman Mac’s third season premieres on September 4th and promises to the best ever! If you don’t receive RTV with your cable package, contact your provider and see what can be done about it! This entry was posted in Convention & Expos, Horror Hosts and tagged BONEY BOB, Chiller Drive-In, RAYMOND DEAN VANDERKOLK, Wolfman Mac. Bookmark the permalink. 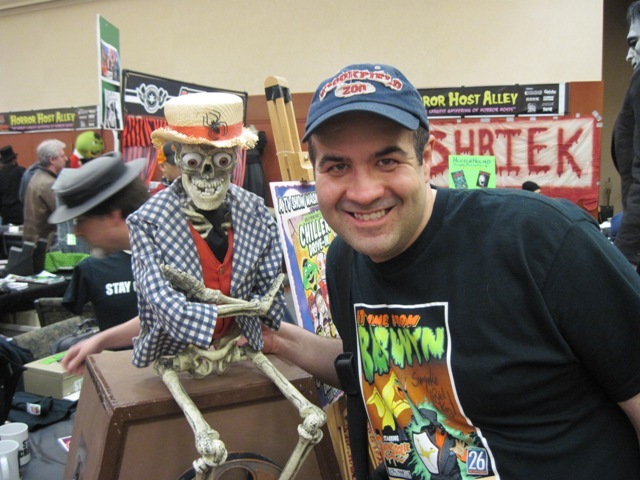 ← Dr. Destruction’s Summer of Lovecraft!